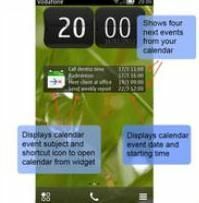 To use Calendar Events start the application from the menu and press “Back” arrow. Then go to home screen and on top of empty slot, long press and select “Add widget”. Then select “Calendar Events” from the list.